First Prize is $2000 and 15 pairs of socks. The winning design will be produced. Second Prize is $500 and 10 pairs of socks. Third Prize is $250 and 5 pairs of socks. NO PURCHASE NECESSARY. 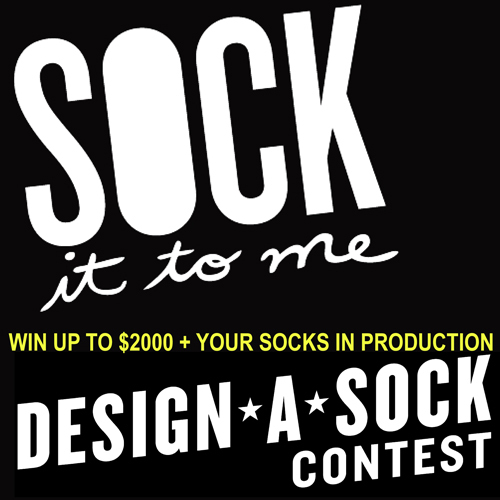 The Sock It to Me “Design A Sock Contest” begins 9 a.m. PST on September 8, 2015 and ends 5 p.m. PST on September 30, 2015. All entries must be received by September 30, 2015 at 5 p.m. PST. Enter online at http://contest.sockittome.com, or by mail to 3605 SE 21st Avenue, Portland, OR 97202. This contest is open to entrants of all ages, but for entrants under age 13, a parent, teacher, or legal guardian must submit any entries. Provide your design title, name, telephone number, and email address. Limit five (5) entries per person. Design submitted must be the entrant’s original creation and shall not be copied or duplicated from previously published art. Design must fill the template provided. All entry forms submitted become the sole property of Sock It to Me and will not be returned, but Sock It to Me won’t use your design without your permission and winning designers will be paid for any designs put into production. Sock It to Me reserves the right to alter any winning design and will not assume liability for any damage, loss or theft of any entry. VOID WHERE PROHIBITED BY LAW. Winning designs will be chosen based on: (1) simplicity of design; (2) use of a maximum of six colors; (3) use of colors that are flat and solids, NO shading, blending or half tones; (4) use of imagery, themes, patterns, or designs that are different from our current line; and (5) originality. On October 2, 2015, a panel of Sock It to Me judges will select approximately 30 semi-finalists from among all eligible entries received by September 30, 2015 at 5 p.m. PST and will upload them to Sock It to Me’s Facebook page. Between October 5, and October 9, 2015 at 5 p.m. PST, Sock It to Me fans, applying the same judging criteria, will vote for the top 3 finalists. At 6 p.m. PST on October 9, 2015, a panel of Sock It to Me judges will select the three final winners and announce them Monday, October 12, 2015 at 9am on Sock It to Me’s Facebook page. Winners (or in the case of children under 13, their parent, teacher, or legal guardian) will be notified via email and/or telephone.